1.1. In the early Indian systems of music, there were two broad categories of musical rendering: Anibaddha Gita and Nibaddha Gita. The terms Anibaddha and Nibaddha could roughly be translated as un-structured (un-bound) and structured (bound). Nibaddha and Anibaddha are two related terms which have a long history. In the Natyashastra, while describing the three aspects of Pada (verbal syllabic structure) it is said: one that is governed by Chhandas and Taala signifies Nibaddha. And similarly, the absence of these is Anibaddha (NS. 32.28-29). 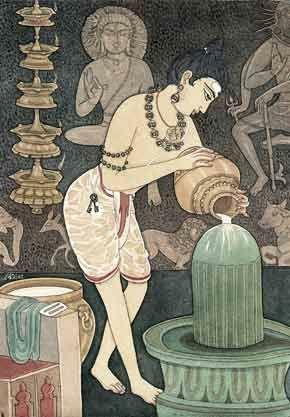 Sarangadeva defines Anibaddha as Aalapi which is not bound or which lacks rules (bandha-hinatva) – Alapir bandha-hinatvad Anibaddham itirita (Sangitaratnakara: 4.5). 1.2. Thus, Anibaddha Gita is free flowing music that is not restricted by Taala; it is also free from disciplines of Chhandas (meter) and Matra (syllables) ; and, it does not also need the support of compositions woven with meaningful words (Pada or Sahitya) . In fact, not one of these – neither Taala, nor Grammar, nor lyrics – has a role to play in the Anibaddha Samgita. 1.3. There is a mention of another way of classifying Nibaddha. It is said; there are two classes of Nibadda: Niryukta and Aniryukta. 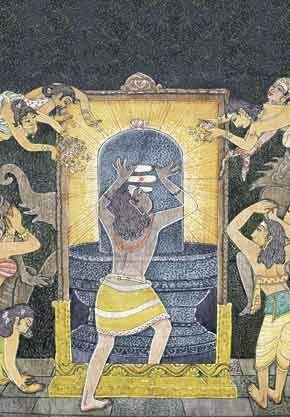 The Niryukta Prabandha was to be sung only to certain specified Taala, Chhandas, and Rasa etc. And, Aniryukta was free from such restrictions. Parshvadeva mentions a third variety called Ubhayatmaka Prabhanda in which some aspects of the song are fixed while others are optional. [By about end of the 19th century, the terms Anibaddha Gita and Nibaddha Gita went out of use; and, were promptly replaced by the terms Manodharma Samgita and Kalpita Samgita. The revised names are very much in circulation today. Though the nomenclatures underwent a change, the principles behind the terms remained almost the same but with little variations. 1.4. In any case, whether be it Anibaddha/ Manodharma or Nibaddha/ Kalpita, the music that is created must be permeated with the fragrance of artistic beauty; and, at the same time, it must respect the norms and disciplines of the tradition in which the music that is played or sung is rooted. Improvisation could be understood as a means of self-expression, where the virtuoso artist brings in her/his own unique genius to adorn and to enhance the beauty and virtuosity of her/his presentation. In other words, Improvisation is a means to upgrade the quality of presentation and give it a stamp of individuality; and yet, it will have to work within the bounds of the system, honouring its norms, disciplines and traditions. 2.1. The most well-known form of the Anibaddha type is the Aalapa (Raga Alapti). The Aalapa rendering is free from set words and Taala too. It is elaborate but delicate and precise presentation of a Raga. It demands from the musician maturity, skill; complete understanding of the Raga and its nature; as also creative imagination. It calls for patience and sensitivity in performing, if it has to evoke the listeners’ admiration and enjoyment. It is the Aalapa that, often, is regarded as a benchmark of a performer’s excellence. 2.2. The absence of Taala in Aalapa does not mean absence of Tempo. Aalapa generally follows a pattern of presentation. It is said to be spread over in four stages. It usually has a rather slow introspective beginning (vilamba) in lower octaves (Mandra), followed by elaborations of the basic theme of the Raga in medium tempo, Madhyama-kaala, building into faster Tempo (Druta) leading to a crescendo (Ati-Druta). Indeed, Aalapa is one of the deeply moving, sublime experiences of the Indian music. 2.3. Apart from Aalapa, there are also other forms of Anibaddha type of music that are not pre-composed; that are not based in words; that are not played to a Taala; but yet , are the expansive elements of music. The most notable of that genre of singing/playing is Taana. Taana or Taanam in Karnataka Samgita (comparable to Jor –Jhala in Hindustani Dhrupad and instrumental music) is played after the Aalapana, but before the commencement of the structured Kriti. 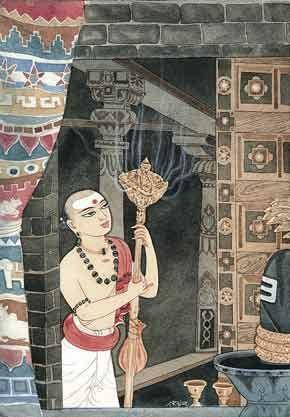 In Karnataka Samgita, Taana is performed both in vocal and instrumental music (but, particularly in Veena playing). These are unique in the sense that with the rise in tempo, the performer improvises and builds into the melody various patterns of rhythms, without, however, the element of Taala. 3.1. In this context, we may also talk about Sangathi, Neraval, Kalpana Svaras and such other elaborations in Karnataka Samgita. At the outset, I reckon these improvisations cannot strictly be considered as Anibaddha. 3.2. Sangathi is a way of weaving patterns elaborating certain lines of a Kriti. 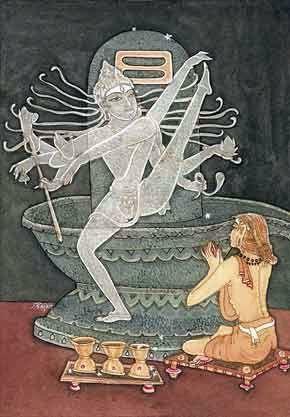 The Sangathi technique was, it is said, introduced by Sri Tyagaraja by adopting it from the Dance. 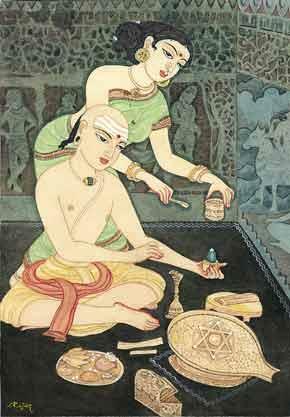 In some of Sri Tyagaraja’s compositions, the Sangathi-s appear in the earlier segment (Pallavi) of the text (Sahitya). But, it has since become a regular part of rendering of Kritis of other composers as well. The Sangathi is, usually, pre-conditioned variations of a phrase or a line of a song. And, the composer would already have envisaged briefer and finer variations of Sangathi-s into his work. The performer brings in her/his own improvisations to elongate the Sangathi-s.
3.3. Neraval, unlike Sangathi, is a small and flickering variation of a melody-filled line of a Kriti or a Pallavi. In Neraval, the Sahitya and its melody is spread out in various ways; and yet, keeping intact the original structure. The Neraval could also be expansive improvisation of the Raga-bhava. Creativity and spontaneous outpouring characterize an enjoyable Neraval. The Neraval is comparable to the ancient Rupaka Alapti (as compared to Raga Alapti) where one line or the whole of the composition was taken up for melodic elaboration without , however, changing the text. The Neraval of the present-day Karnataka Samgita is an aspect of the improvised Manodharma Samgita. And, in a concert, it precedes the Svara Kalpana. 3.4. Kalpana-Svara or Svara prastara is the expansion on the rhythmic patterns of the Svara (Sa, Re, Ga, Ma etc). It is a free-rendering. And, is a highly improvised presentation, often playful, that appears in the latter part of the song-rendering. An entertaining Kalpana-Svara rendering calls for enterprising variations, often involving the accompaniments (Violin and the percussion instruments) in a good-humoured interplay (saval-javab). It, therefore, has great popular appeal. 3.5. As can be seen, Sangathi, Neraval or elaborations of the rhythmic patterns (Svara –prastara) are all based in Taala and are tied to the words in the text (Sahitya) of the composition. Though these provide immense artistic freedom to elaborate and to improvise in varied imaginative patterns, I reckon these are not strictly of the Anibaddha type. 4.1. Sarangadeva (13th century) in the fourth Canto of his Sangita-ratnakara says: the Gayana (singing) is twofold – Nibaddha and Anibadda. That which is composed of Anga-s (limbs or parts) and Dhatu-s (elements or sections) is Nibaddha Samgita. And Alapita which is free from such structures is known as Anibaddha Samgita. (Chaturbhir-dhatubhih shadbhishcha-angairyah syat prarbandhate tasmat prabandhah). He also recognized the classifications of Prabandha, Vastu and Rupaka. In the fourth Chapter of his Sangita-samaya-sara, he explained the Prabandhas like Dhenki, Lambaka, Rasaka, Ekatali, etc. together with eleven kinds of Dhruva, and the process of singing (ganakrama), the Giti. 5.1. When the main sections of the composition contains all the Anga-s and Dhatu-s, either separately or in combinations, it is considered to be a Prabandha composition (13.7) . 5.2. As compared to Prabandha which has all the Angas, something which is exclusively composed of regular words (Pada) and musical metre (Taala) is said to be Vastu (lit substance or thing). 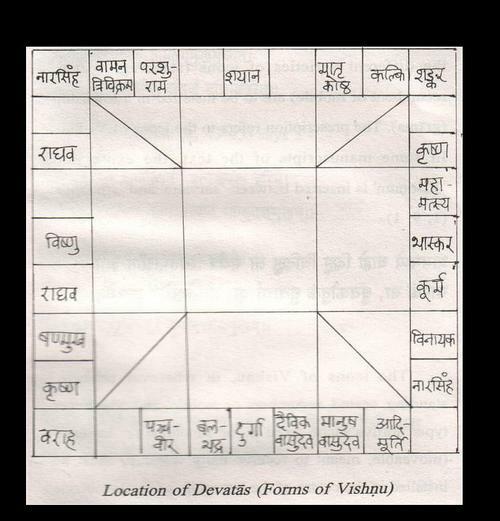 It has the freedom to omit some of the Anga-s.
Kumbha (15th century) in his Sangita-raja (2.4-6) explains Vastu as one in which there is (vasanti) always (nityam) some Dhatu and some Angas (Dhatavo Angani kinchit); and its good sound is important (sad-vastu-dhvani-mukhyena). It is also said; that which ends in Apanyasa, Amsa and Nyasa (or else samnyasa), is Vastu. Amsa the dominant note is the note in which the Raga resides (ragas ca yasmin vaasati) and manifests (raga-abhivyaktir bhavathi); and from which the movement of the low (mandra) and high (Tara) registers of five Svaras starts. Amsa is a Vivadi Svara. Nyasa is the final note which occurs at the end of a section of the composition (Anga) – Nyaso hy Anga-samaptau. It is the note on which the song is fixed and ended. The final note is also described as the ‘name-giver’ as it gives the Jaati its name – Nyasas tu Svra-jaatishu namakrt. 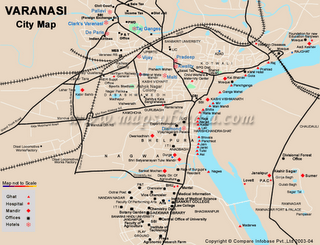 As compared to Nyasa, Apanyasa is the penultimate note. It occurs before the final note (Nyasa), in the midst, which is to say in the Anga (section) – Anga-madhye. The Dramatic compositions based in music (Geya-prabandha) also termed as Drshya Kavya ( a poem that is to be seen as also heard) were arranged as Rupaka and Upa-Rupaka (minor forms of Rupaka). It is said; there were ten types of Rupaka-s and eighteen types of Upa-Rupakas (depicting a short theme or a self-contained section taken from a larger theme). In Music, when there is scope for developing the melodic form (Raga) and other elements (ragadya-aropa) in a dramatic form, such composed music is called Rupaka (lit from) (13-8). It is explained by the later scholars that in Rupaka Alapti, either one line or the whole Prabandha is taken up and melodic variations are sung with the lyrics of the Prabandha. [And, this perhaps resembled the Neraval of the present-day music]. Such composed music (Nibaddha) which is formed with Anga (phrasal elements) like: Pada (passage of meaningful words), Svara (tone syllables or passage of sol-fa syllables),Birudu (words of praise, extolling the subject of the song and also including the name of the singer or the patron), Taala (musical meter or time-units ), Paata (vocalized drum syllables) and Tenaka (vocal syllables , meaningless and musical in sound with many repetitions) are known as Prabandha (13.5) ; and that which has in its main sections Dhatu-s (elements) : Udgraha, Melapaka, Dhruva and Abogha. However, in the context of Music, Prabandha is a comprehensive term which refers to a well-knit composition. And, within in the gamut of Music itself, the Prabandha stands for a particular, specified form of songs constructed according to a prescribed format. 6.3. 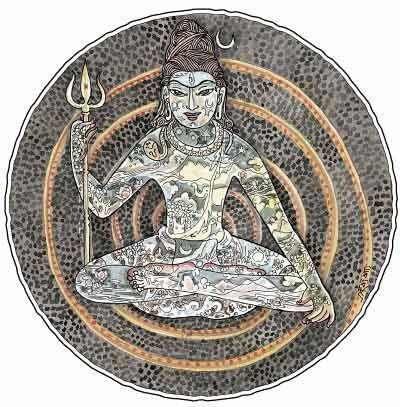 As said earlier, the Prabandha is conceptualized as Prabandha Purusha, a living organism , consisting six limbs , which function harmoniously as do the limbs of a healthy human body. Thus, Prabandha could be understood as a type of harmonious musical composition set to words, Raga, Taala, Chhandas, Vrtta; and governed by six Anga-s (Svara, Birudu, Pada, Tena, Paata and, Taala) and four sections-Dhatu-s (Udgraha, Melapaka, Dhruva and Abhoga). 6.4. Prabandha is basically a variety of Khandakavya (not particularly associated with Drama); and, at the same time it is also a song. 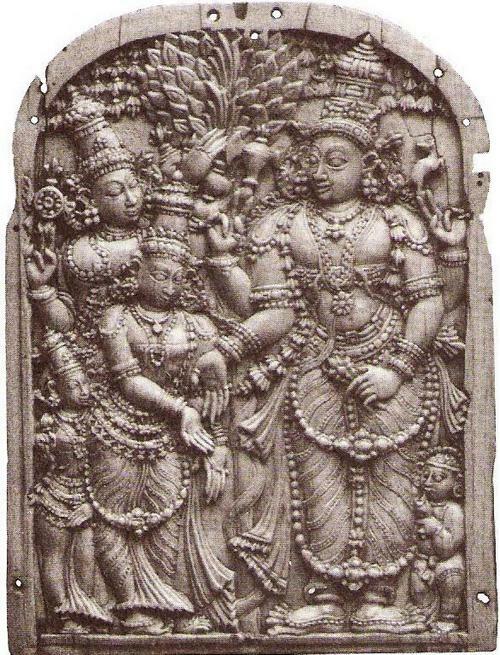 And, therefore, the Chhandas and Taala rather than the musical element were central to the composition (perhaps with the exception of Geya prabandha s). 7.1. Prabandha-s do not figure in the earlier texts like Nāţyashastra and Dattilam. They are dealt with in the texts written after the 5th -6th century , such as : Brihaddeshi (Ca, 5th century); Sangita-Samayasara ( Ca. 11th century); Manasollasa (Ca,12th century); Sangita-ratnakara (Ca,12-13th century) Sangita –samayasara (12-13th century) ; Sangita – damodara (Ca.14th century) ; Sangita–shiromani (15th century); Chaturdandi Prakasika (c.1635 CE) and others. These texts describe the nature and the varieties of Prabandha, the salient features of their variations and the elements that are involved in the construction of Prabandha songs. 7.2. Prabandha as a class of Music was, perhaps, first mentioned in the final Canto of Matanga’s Brihad-deshi (Ca.5th century). Here, he described Prabandha simply as Prabhadyate iti Prabandhah (that which is composed is a Prabandha); and, classified it under Desi Samgita (a collection of many song types then popular in various regions). Matanga explains Desi Samgita with the aid of about forty-eight Prabandha songs. However, Matanga remarks that the Prabandhas are indeed countless; and ‘their complexities are beyond the understanding of weaker minds’. Some of the Prabandha- types mentioned in this text are: Kanda, Vŗtta, Gadya, Catushpadī, Jayavardhana, Ela and Dhenaki. (He pays particular attention to Ela) And, while describing the nature of Prabandha-s, Matanga did not employ terms such as Dhatu and Anga, as was done in the texts of the later periods. 7.3. 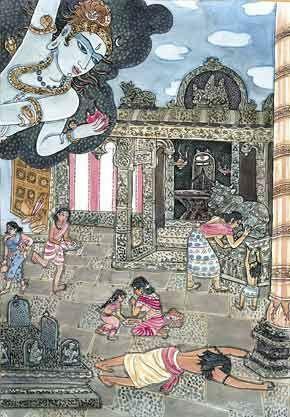 Prabandha received a detailed treatment in the fourth Chapter Prabandha-adhyaya of Sarangadeva’s Samgita-Ratnakara which appeared about five centuries after Matanga. By the time of Samgita-Ratnakara, Prabandhas had grown into thousands. Sarangadeva explained Prabandha as that which is pleasant; and that which is governed by rules regarding Raga, Taala, Chhandas, Vritta (Sanskrit verses) and Anga. 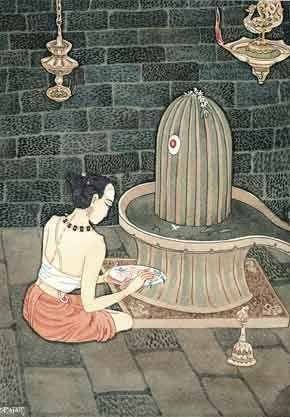 In his work, Sarangadeva described about 260 types of Prabandha-s with their variations. 7.4. Sangītasiromaṇi (15th century) in its Chapter Eight presents a wealth of details on the Prabandha-s. It describes the four classes or cycles (Shuddha Suda, Ali karma, Salaga Suda and Viprakirna) of the Prabandha songs; the criteria of six elements (Anga-s – Taala, Svara, Pata Birudu, Tena and Pada) and four substances or Dhatu-s (Chhandas, Raga, Varna, and Gamaka). 7.5. Later, in his monumental work Chaturdandi Prakasika (c.1635 CE) Venkatamakhin gathered various music-forms under a fourfold system (Chaturdandi) comprising Gita, Prabandha, Thaya and Aalapa. Here also, Prabandha was described as ‘prabandhayeti Prabandha’ – that which is well structured (Nibaddha) is Prabandha. However, the definition of Prabandha was narrowed down to include only those compositions which are made up of Six Angas (shadbhirangaisca) and Four Dhatus (chaturbhidhaturbhischayah). 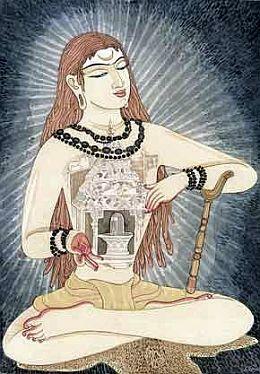 He also names the six Anga-s or elements of the musical Prabandha-s are Svara, Birudu, Pada, Tenaka, Paata and Taala. The four Dhatus are Udgraha, Melapaka, Dhruva and Abhoga. 8.1. The Prabandha, generally, appeared to be highly ornate, varied compositions formed out of many sections (Dhatu) . They were ornate both in their elaborate poetical diction (Alamkara) and abundance of rich language (Sabdalankara) adorned with meaning (Arthalankara). They were varied in the sense that many songs featured a mixture of different languages (Bhasha), Taala-s, Ragas; and frequent alteration between meaningful text and meaningless syllables. They were sectional in that Prabandhas were divided into distinct formal divisions and components with many changes of tempo, Raga and Taala. The word-play (pada-jala) was also prominent in the repertoire with clever use of alliteration of letters (anuprasa); alliteration of words (pada prasa), ambiguous use of a word where it conveys different meanings depending upon the context (latanu-prasa), play of pun (slesha or sabda slesha), change of voice (kaku) , and poetic subversion or deviant expression (vakrokthi) etc. The word (pada), meter (Chhandas) and Music (gana) were well structured and coordinated. Prabandha was the dominant song-form for about thousand years or a little more till about the 17-18th century, which is until the advent of the Trinity of Karnataka Samgita. 9.1. As Matanga remarked, the Prabandhas are indeed countless; and, ‘their complexities are beyond the understanding of weaker minds’. Yes; it is a virtual jungle. 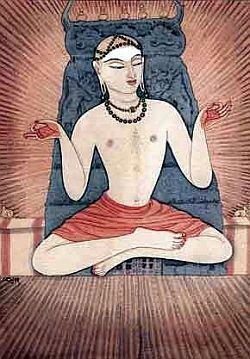 With that, the major types of Prabandha were counted as four: Shuddha Suda, Salaga Suda, Alikrama and Viprakirna. : – The Shuddha Suda was again divided into eight parts: Ela, Karana, Dhenki Vartani, Jhombada, lambaka, Rasaka and Ekatali. : – And Salaga Suda was divided into seven parts: Dhruva, Mantha, Pratimantha, Nisaruka, Addatala, Rasaka and Ekatali. : – The Viprakirna was divided into Sriranga, Tripadi, Chatuspadi, Shatpadi, Vastu, Vijaya etc. 10.1. It is virtually not possible here to discuss all or even the most of the Prabhanda varieties. For the limited purpose of this post let’s, therefore, confine to the main or the better known types of Prabandhas. Let’s take a look at the major types of Prabandha, their structure, elements and their other components in the next Part. But all texts generally agree that the square or the rectangular shape of layout are the best and most auspicious. 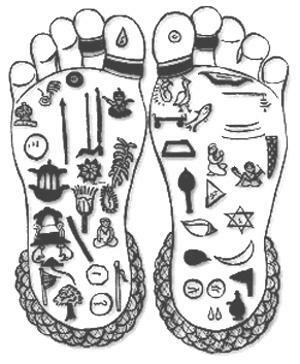 Varaha-samhita calls such layouts as Siddha-bhumi, the best of all. In case the layout is rectangular ,the North South dimension should be greater than East-west dimension. It is also said , it would be better if the elevation on the west or the South is slightly higher. For the limited purpose of this discussion let us stick to the square or rectangular layout, ignoring the rest. Else, I fear, it might get too complicated. 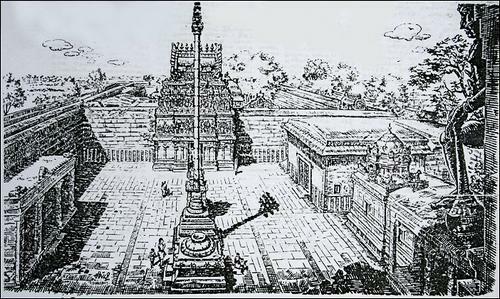 The drawing of the court yard of the Shiva temple at Thiruvālangādu, by the famous artist Silpi. 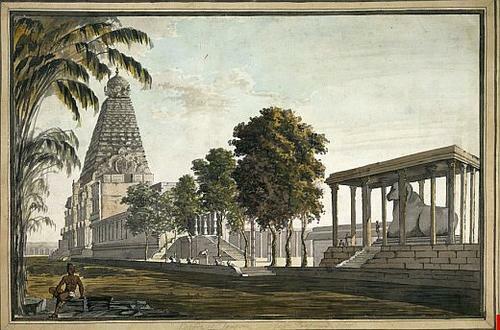 Having determined the suitability of the land for constructing a temple, and having drawn up the Vastu Mandala of the town and identified the temple location ; the next stage is to draw up a construction plan .This specifies the location, the size and the orientation of the various temples to come up in the proposed complex. This again involves preparation of another Vastu Mandala. The land considered suitable for the purpose of constructing the temple (vastu bhumi) and placed at the center (Brahma Sthana) of the Vastu mandala of the township must be in the shape of a rectangle or a square. The ratio between the breadth and the length of the area may be 4:8; 4:7; 4:6; or 4:5. (The square would be 4:4). 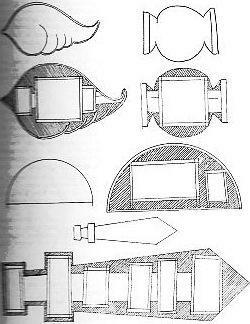 Shapes of sites to be avoided are: circular (vritta), triangular (trikona), rod shaped (dandakriti), bow shaped (dhanur akara) and other irregular shapes. 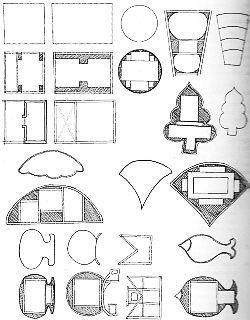 And, in case it becomes necessary to construct a temple on a land of such “un approved” shape, the area meant for the temple should be demarcated and rendered a square or a rectangle in shape. 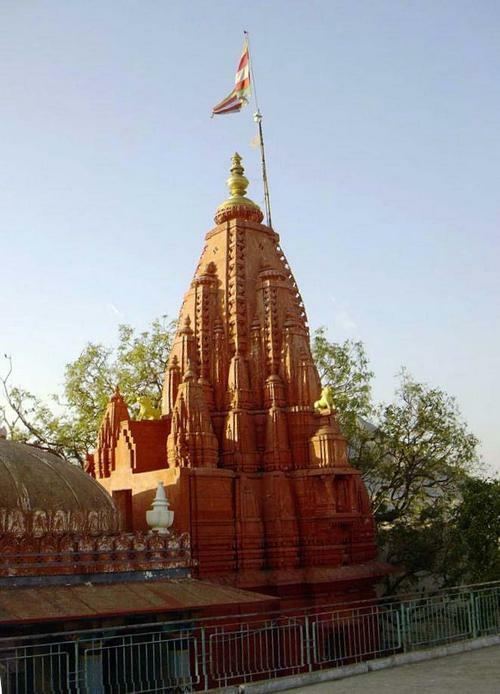 Even the ancient temple of Sri Vishwanatha of Kashi that was later destroyed by Aurangzeb , during 1669 CE, was in form a square , with the sanctum at the heart of it. Incidentally, the Buddhist and Jain temples too follow the same principles. Even the Sri Harmandir Sahib, the Golden Temple at Amritsar is structured in a square shape; with the Sanctum placed in the Brahma sthana. 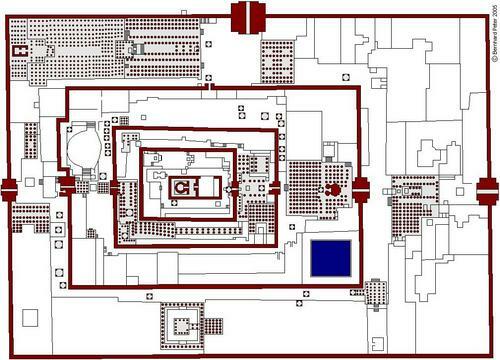 The following is the layout of a Jain temple. In case of a rectangular site, it must have north – south orientation. The depth of the site (Aaya-profit) should be more than its breadth (vyaya-loss). 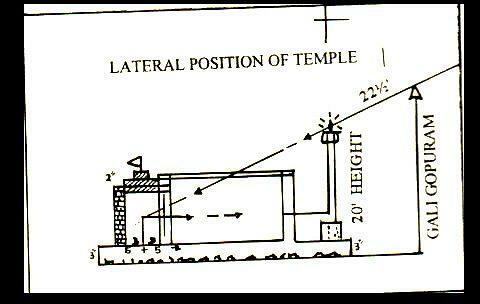 That is the reason we find our temple walls (prakara) on north-south shorter than the walls on east-west. 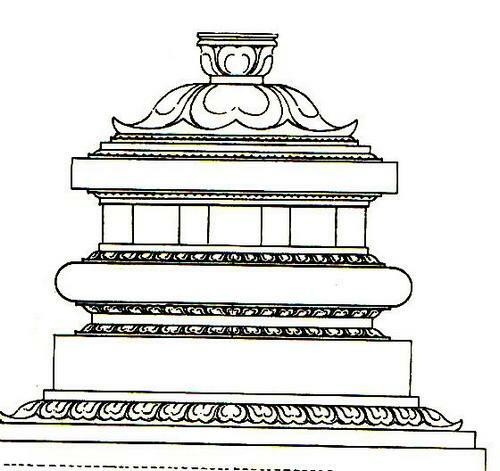 The slope of the land surrounding the temple in the east and the north direction should be in the northeast corner. Fountains or lotus ponds of the temple should be in the northeast direction. In the open space surrounding the temple, Tulsi ( Basil) plants with raised bed should be in the east; the Jasmine, white Champak, Star Coral plants etc. should be in the northwest corner or the east. Four approach roads are much recommended. The preliminaries for construction of a shrine include preparations of a plan, Vastu Purusha Mandala, a Yantra, with unit cells (pada) of 64, 81 or 256 in number. The entire process is rich in symbolism. The square shape of the Mandala is symbolic of earth, signifying the four directions which bind and define it; and the Vastu is the extent of existence in its ordered site; Purusha being the source of existence. 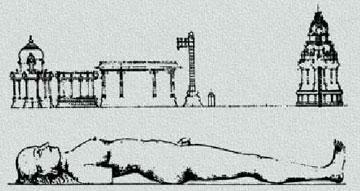 The ground plan, again, is symbolic and is the representation of cosmos in miniature. The Vastu Purusha represents terrestrial world with constant movements. The grid made up of squares and equilateral triangles is imbued with religious significance; with each cell belonging to a deity. The position of the deity is in accordance to the importance assigned to him .The central portion of the square (Brahma Sthana) is occupied by the presiding deity of the temple ; while the outer cells house deities of lower order. Another important aspect of the design of the ground plan is that it is intended to lead from the temporal world to the eternal. The principal shrine should face the rising sun and so should have its entrance to the east. Movement towards the sanctuary, along the east-west axis and through a series of increasingly sacred spaces is of great importance and is reflected in the architecture. This process of drawing the Mandala , known as Pada-vinyasa or Vastu mandala Vinyasa is essential not only for construction of the main temple but also for deciding upon the location, the orientation and the size of the sanctum; and for placement of retinue-divinities. Let us look at the following example of an 81 cell parama-saayika layout. 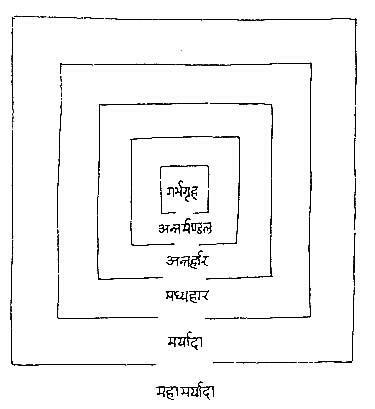 The site-plan is to be regarded as the body of the Vastu-purusha whose height extends from Pitrah (in the bottom left corner) to Agni (top right corner). The Vastu purusha mandala is in some ways a development of the four pointed or cornered earth mandala having astronomical reference points. The mandala of 81 squares has 32 squares around the border representing the four cardinal points and the lunar constellations. It is the representation of all cyclical time; lunar and solar. Brahma is the God at the centre. The Manduka Mandala (8×8) the whole square would be divided by the two axes that go North-south and East-west. In the case of Parama Saayika Mandala (9×9) , the entire square would be unevenly divided. 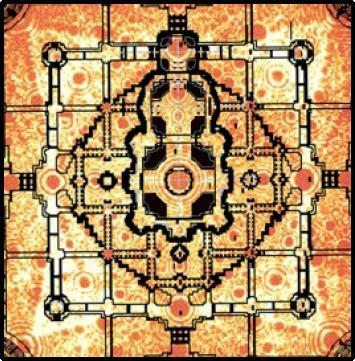 The center of the mandala consisting nine cells is dedicated to Brahma, the first of beings and the engineer of universal order. The Three cells to its east are for Aryaman, three cells to its west are for Mitra and three cells to its north are for Prihvidhara. In this site plan 32 spirits reside in the outer ring. There are 8 spirits in four corners. There are four spirits surrounding Brahma. Thus there are in all 45 spirits (including Brahma). Dikpalas or guardian deities of different quarters, who assist in the affairs of universal management, are an important part of the Vastu. Indra, Agni, Yama, Niritti, Varuna;, Vayu , Kubera and Isana; reside in the East , South-East , South, South-West, West, North-West, North and North-East respectively. All except Kubera are principal Vedic deities. This provides a method that determines the requirements of architecture in relation to its directions. The vastu-purusha-mandala, forming a sort of map or diagram of astrological influences that constitute the order of the universe, is now complete. When placed on the building site the vastu-purusha-mandala determines the positions and orientations of the temples and the time for commencing the construction. Only by the combination of the vastu-purusha-mandala and the astrological calculations can this factor be ascertained. 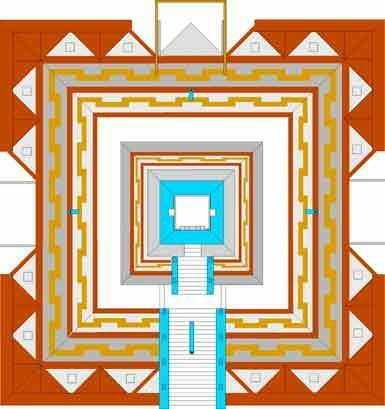 From the diagram of the vastu-purusha-mandala the architect next proceeds to develop the vertical and horizontal dimensions of the temple. The square, the rectangle, the octagon and the pentagon are fundamental patterns in the horizontal or ground plan. In the vertical alignment the pyramid, the circle and the curve are more prominent. 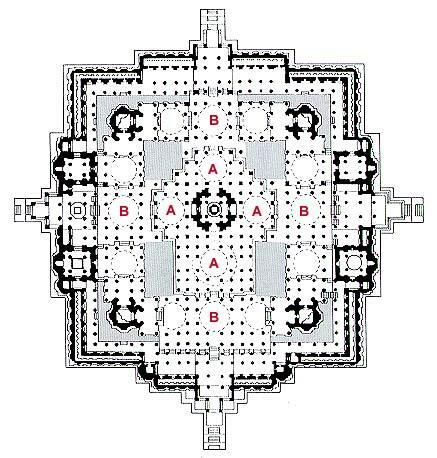 The subdivisions of the ground plan include thebrahmasthana (the main shrine and smaller chapels) and the mantapa(balconies, assembly halls and auditoriums). 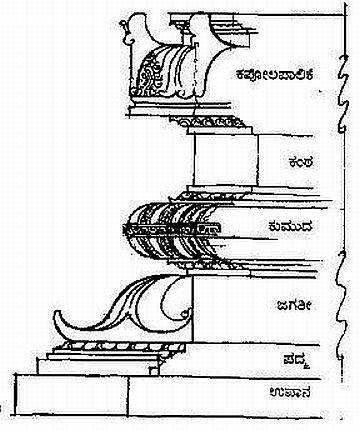 The vertical plan consists of drawings for the gopura (entrance ways), the vimana (the structure above the main shrine or chapel) and the prakara (the walls). 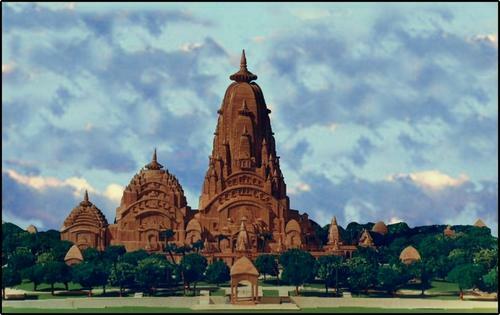 The construction of the temple follows in three dimensional forms, in exactly the patterns laid out by the mandala. 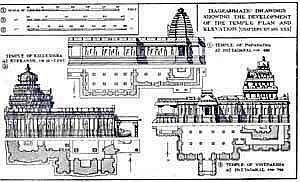 The relationship between the underlying symbolic order and the actual physical appearance of the temple can best be understood by viewing it from above (top elevation). In order to establish the vastu-purusha-mandala on the construction site, it is first drafted on planning sheets and later drawn upon the earth at the actual building site. The ground for civil construction is demarcated by dividing the site into 81 cells, by drawing 10 lines from East to West and 10 lines from North to South in which Vastu Mandala deities are installed. In addition the deities of the Sarvathobhadra-mandala are also established after performing Vastu Homa. The drawing of the mandala upon the earth at the commencement of construction is a sacred rite in itself. The cells sustain the temple in their own sphere of effectiveness, in the manner that the actual foundation supports its weight. Shilanyasa is the ceremony for laying foundation stone. It is the laying of the first stone (square in shape) or a brick signifying the start of construction. 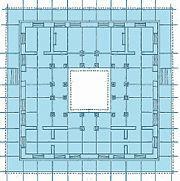 It is laid in the north-western corner of the building plan, drawn on the ground. After this, the construction of the foundation is taken up. The foundation is built and the ground filled up, up to the plinth level, except in the middle portion of the garbhagraha area, which is filled up three-fourths. The sanctum is technically known as Garba-Griha. This part of the temple is usually constructed first. The ceremony related to it is known as Garba-dana or Garba-nasya; and, it involves letting in to the earth a ceremonial copper pot, containing nine types of precious stones, several metals, minerals, herbs and soils symbolizing creation and prosperity. The following is a little more detail about it. The Brahmasthana , the principal location in a temple where the Garbagraha will eventually come up, is the nucleus of the Vastu Purusha Yantra. At thebrahmasthana, as drawn on the grounda ritual is performed calledgarbhadhana, inviting the soul of the temple (Vastu Purusha) to enter within the buildings confines. In this ritual, a golden box is imbedded in the earth. 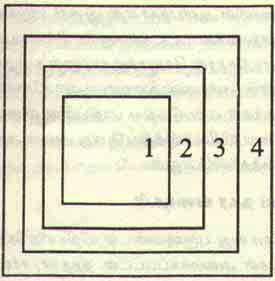 The interior of the box is divided into smaller units exactly resembling thevastu-purusha-mandala. All the units of the gold box are first partially filled with earth. In the thirty-two units representing the nakshatras (lunar mansions), the units of Brahma and the twelve sons of Aditi, the priest places an appropriate mantra in written form to invoke the presence of the corresponding divinity .An Image of Ananta , the hooded serpent , is also placed in the box. Ananta, meaning eternal or timeless, also represents theenergy that supports the universe. The box also contains nine precious stones – diamonds, emeralds, rubies, pearls, yellow sapphire, and blue sapphire, red coral, cats-eye and jade – to appease the nine planets. A stone slab (adhara-shila) is thereafter placed over the spot the copper pot is buried.And, over this slab will rise the foundation for installing the Mula-bhera. The copper pot signifies the womb; and icon the life arising out of it. The sanctum constructed around it is the body. That pot represents the roots of the “temple-tree”; and the icon its sap. The four walls around the icon represent the branches spreading around. 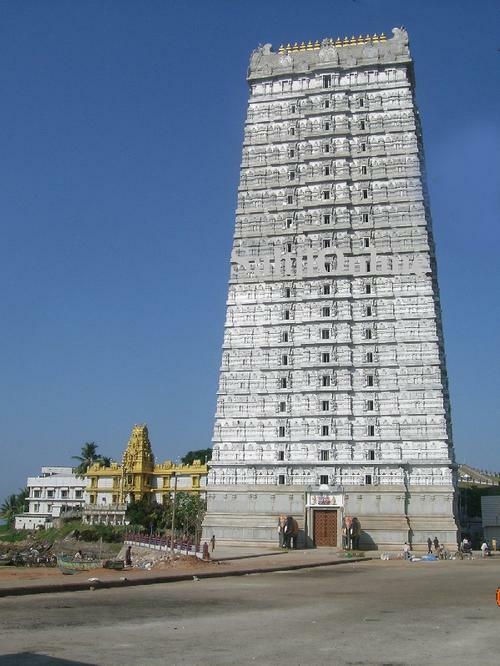 The structure of the Vimana rises above it in a series of tiers. 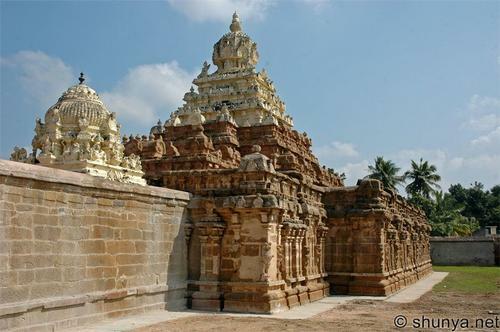 The roof resting over the walls is called Kapotha, meaning where the doves rest. The imagery suggested is that of a tree with birds perched on its branches. The sanctum is thus a model of a growing tree. Another set of symbolism is that the foundation of the temple represents the Earth (prithvi); the walls of the sanctum the water (apaha); and the tower over it the fire (tejas). The final tier of the Vimana is air (vayu) and above it is the form-less space (akasha).The sanctum is thus a constellation of five elements that are basic building blocks of all existence. Once the garbhadhana and agni-hotra ceremonies are complete the actual construction of the temple commences according to the plan. When the foundation is finished the vertical structure is raised. 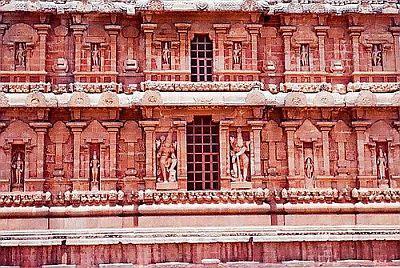 The external features of the temple are brought to life through finely sculpted figures and paintings. The art and sculpture frequently portray the forms of divine entities and the different stages of consciousness in the gradual evolution of life throughout the universe. It is believed that the Vastu Purusha sleeps during Bhadrapada, Ashviyuja and Karhika months facing east. During Margashira, Pushya and Magha months he sleeps facing south; In phalguna, Chaitra and Vaishaka, he sleeps facing west. And, in Jeysta Ashada and Shravana, he sleeps facing north. The doors facing towards those directions are fixed in the respective months. 1. 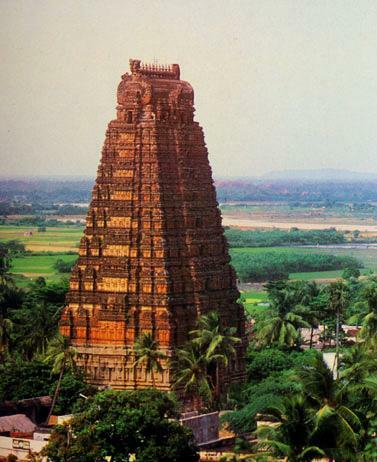 A Towering structure called the Rajagopuram (pyramid in pattern) on the Eastern side at the entrance to the Temple. 2. 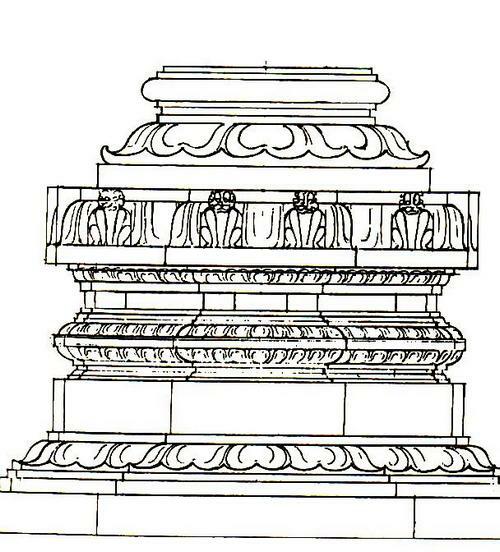 A Dwajasthamba (pillar) in line with the main shrine immediately after the Rajagopuram. 3. 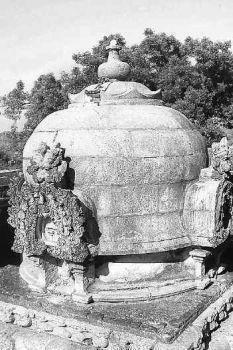 Near the Dwajasthamba is a lotus shaped pedestal for offerings, called the Balipeeta. 4. 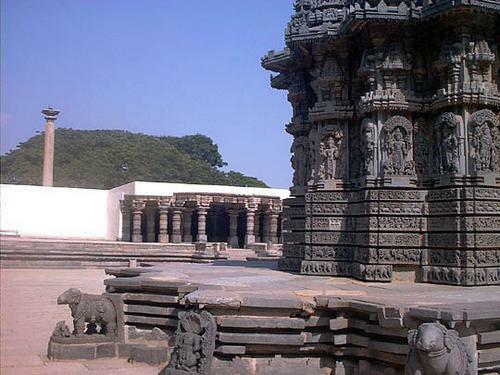 A large Mandapa or hall for assembly of devotees. 5. The passage through the Mandapa leads to the “Garba-Griha” (womb chamber) where the Main Deity is installed. 6. Ardha Mandapa adjacent to the main Mandapa and before the “Garba-Griha”. 7. 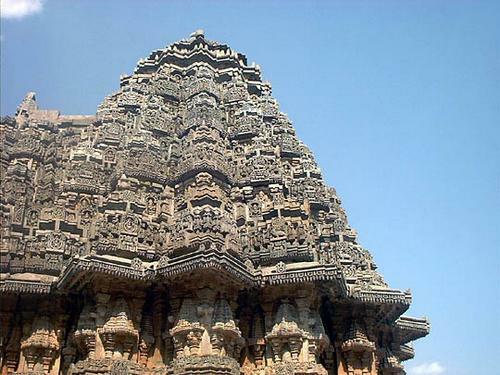 The Main Deity faces East word inside and the Garba-Griha is located inside a structure or sanctuary called the “Vimana”. 8. 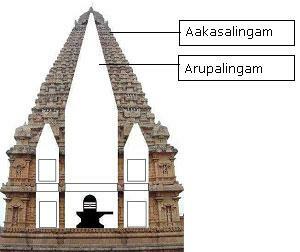 The pyramidal or tapering roof over the Deity is called “Shikara” or “Gopuram” which is a dome. 9. 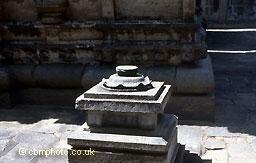 There is a circumnutating passage or “Pradakshira Patha” around the Garba Griha and Mandapa. 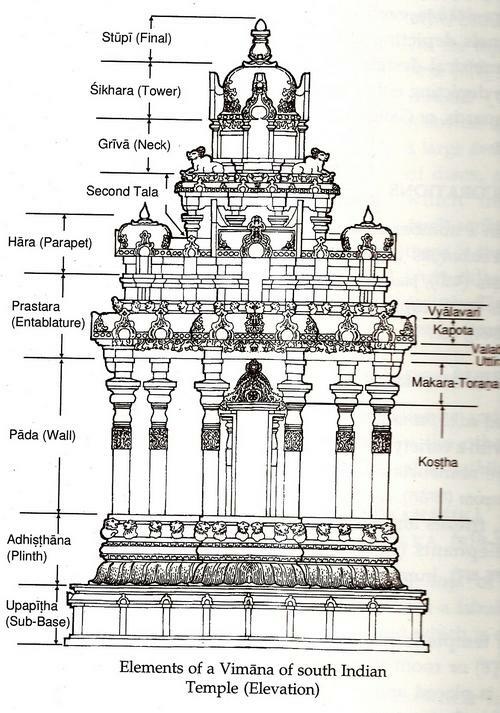 The above design applies both to the “Shiva” and “Vaishnava” Temples with small variations. 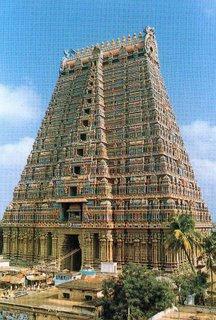 Architecture is otherwise called “Shilpa” and the one who constructs the Temple is called a “Sthapathi”. The “Sthapathi” is an expert in Temple architecture and idol creation. 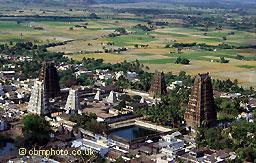 The procedure of worship in the Temple is known as “Agama Vidhi”. 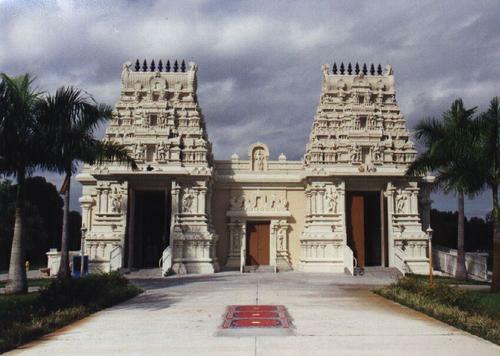 The Temple is not only a home of God but his representation in the structure of temple which resembles human form. 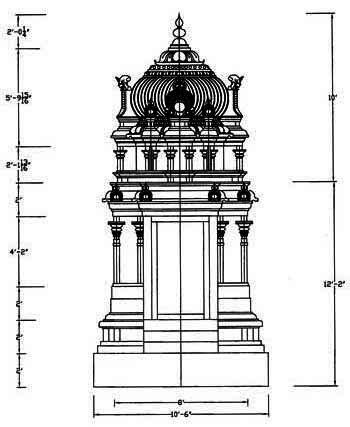 The symbolism of the temple plan and elevation suggests that the garbhagrha represents the head and the gopuram the feet of the deity. Other parts of the building complex are identified with other parts of the body. For instance, the sukhanasi or ardhamantapa (the small enclosure in front of the garbhagrha) is the nose; the antarala (the passage next to the previous one, leading to passage next to the previous one, leading to the main mantapa called nrttamantapa) is the neck; the various mantapas are the body; the prkaras (surrounding walls) are the hands and so on. Vertically, the garbhagrha represents the neck, the sikhara (superstructure over the garbhagrha) the head, the kalasa (finial) the tuft of hair (sikha) and so on. Another interesting symbolism is that when a devotee enters the temple, he is virtually entering into a mandala and therefore participating in a power-field. His progress through the pavilions to reach the sanctum is also symbolic. It represents the phases of progress in a man’s journey towards divine. In accordance with this scheme, the architectural and sculptural details vary from phase to phase ; gradually leading him to the experience, which awaits him as he stands in front of the deity in the in the sanctum. This is explained in the following way. On reaching the main gateway, a worshipper first bends down and touches the threshold before crossing it. This marks the transition from the way of the world to the world of God. Entering the gateway, he is greeted by a host of secular figures on the outer walls; representing the outward and diverse concerns of man. As he proceeds, the familiar mythological themes, carved on the inner walls attune his attitude. The immediate pavilion and vestibule near the sanctum are restrained in sculptural details and decorations; these simpler motifs and the prevailing semi darkness help the worshipper to put aside distractions and try focusing his attention on the sanctum. Finally the shrine, devoid of any ornamentation, and with its plainly adorned entrance, leads the devotee further to tranquility, to fulfilment and to the presence of God. The garbhagriha is usually surrounded by a circumambulatory path, around which the devotee walks in a clockwise direction. In Hindu and Buddhist thought, this represents an encircling of the universe itself. 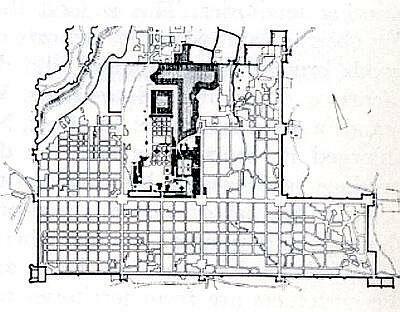 The following plan indicates the position of gods and goddesses in an 81 celled temple-site. 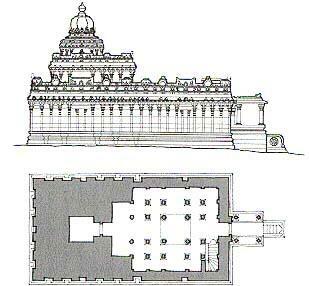 This plan relates to construction of a Vishnu temple. Atri Samhita ( 2.38.42) prescribes that the central Brahma bagha must be divided into four equal parts and the main shrine facing east must be located on the North-western side thereof. The shrine must have five sanctums, to house five forms of Vishnu; and the shrine should have three stories. The icon of Vishnu , the principal object of worship, may be represented in the shrine in one of his many forms . It could be single ( eka-murti-vidana) or many ( aneka-murti-vidana). The aneka forms might be : 5 (pancha murti); 6 ( shan murti); or 9 ( nava murti). 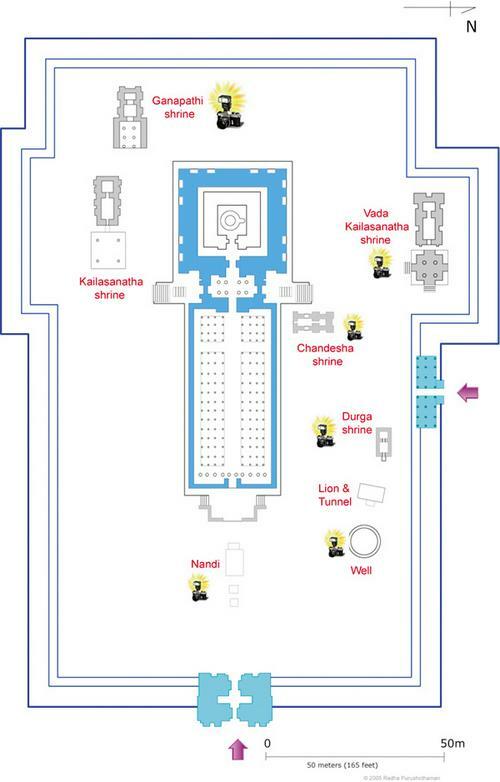 Coming back to the issue of placing the sanctum slightly to the North-West; this feature occurs in the temple of Sri Venkateshwara at Tirumala too. The enclosure immediately surrounding the sanctum called Mukkoti Pradkshina is rather skewed. The width of the enclosure is uneven; and the enclosure is open on only three sides. 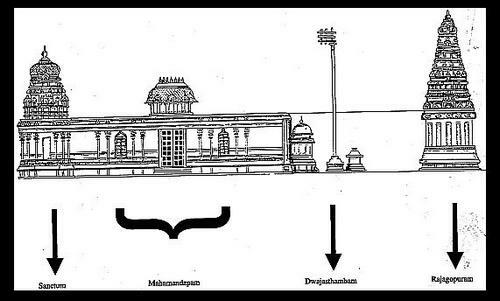 The path in the south (on the right side of the deity) is seven feet wide and twenty feet long; while the path on the other side (towards the left of the deity) is seventeen feet wide and ninety-two and half feet long. This skewed position of the sanctum, slightly to the North West; within the Brahma bagha was perhaps to satisfy the requirements of the temple vastu norms. 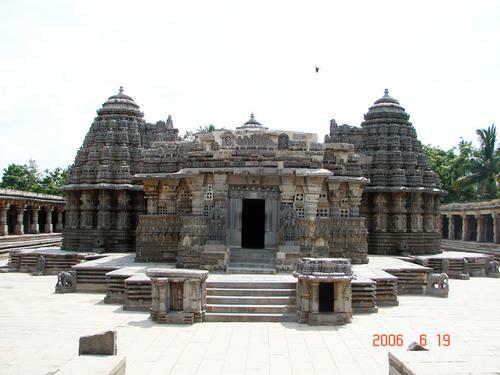 The Shiva temples too have their own configuration. 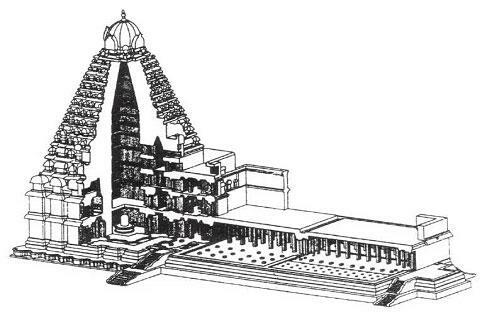 In a Siva temple, the Shivaliga would be placed at the Brahma sthana, the shrines are dedicated to Parvathi, Ganapati, Subramanya , Veerabhadra and Candesvara would placed in the surrounding cells of the temples Vastu Purusha Mandala; as illustrated in the following typical layout of the famous Shiva temple at Gangaikondacholapuram(mid 11th century). 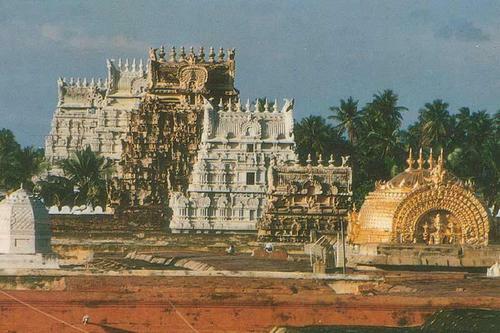 Similarly in the Sri Kailasanathaswamy and Nithyakalyani Amman Temple, Ilayathakudi ( near karaikudi), Shiva shrine is at the Brahmastana, opposite to Shiva is lined Nandi, Bali pita and Dwajasthamba. 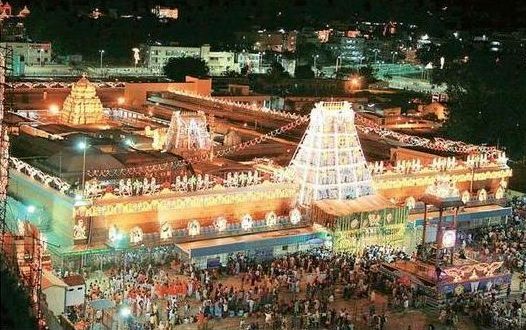 The shrine of Nitya_kalyani Amman is located independently in the North. In the Mantapa adjoining the Sanctum are Ganapathi, Durga and Skanda. 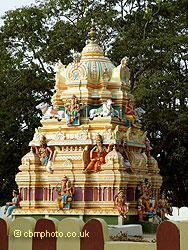 The Saptha Mathrikas, the seven female divinities, have their shrine in the Prakara behind the shrine. 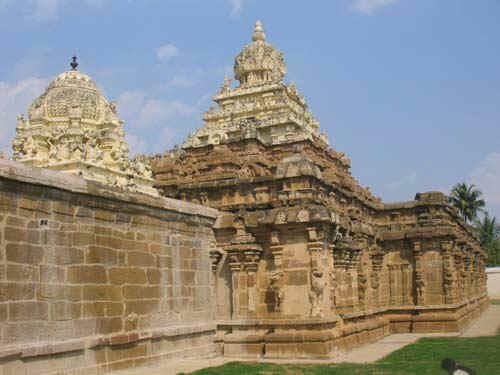 The Shakthi temples have their layout with shrines for other manifestations of the Mother Lakshmi , Saraswathi , Durgi , Chamundi and related goddesses.